During my trip to Puglia, I spent a couple of evenings at luxury farmhouse, Masseria Torre Coccaro, nestled in Fasano. It's a low-key place where high-key Italian celebs have been known to frequent. Masserias themselves are typically large, rustic and elegant country houses found on estates in Puglia, where land barons stored their food and possessions between the 16th-18th centuries. 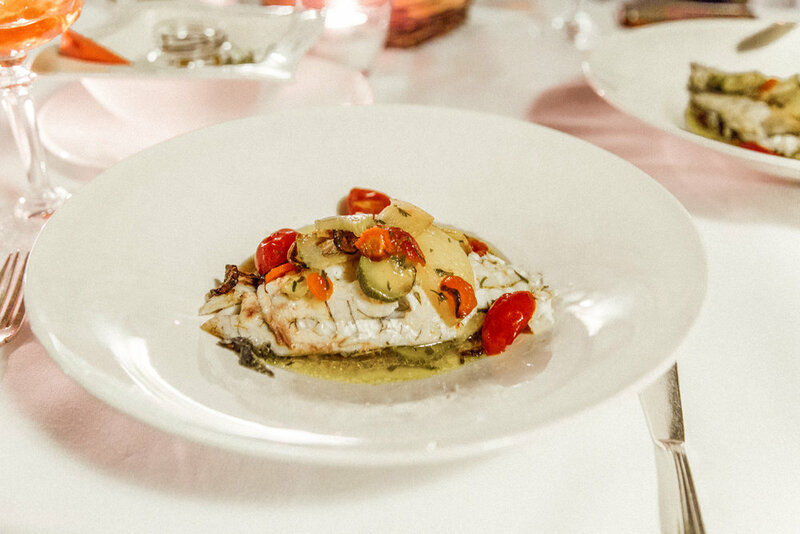 Apart from Torre Coccaro's beautiful spa, which is embedded in an underground cave with a thermal pool and lounge areas galore (strong Aladdin vibes), it was the delectable cuisine that formed the highlight of our stay. We spent so much time eating and drinking that it's a genuine wonder why we didn't start rolling everywhere. Every night we were wined and dined. Actually, throughout the entire weekend we ate so much rich, high quality food that it was a tough return to British food. On our first balmy afternoon, the farmhouse organised an incredible traditional Puglia cooking lesson with head chef, Massimo - a charming man who repeatedly said, 'forget about it' with a heavy accent and almost zero trace of irony. Massimo had tousled dark hair, wore chunky silver rings, a gold chain necklace, and kneaded dough with the confidence of a man who'd baked all his life. The intimate cooking class was held in a stone tavern full of fairy lights and and caves. We were given embroidered aprons, and a butler came out of nowhere and popped open a bottle of Prosecco for us to enjoy during the class. Dreamy! Massimo taught us how to make three types of pasta from scratch, including spaghetti and orecchiette (little ears) a baked sea bream dish with fresh vegetables and light seasoning; a calzone-style folded pizza with vegetables and cheese; and a sensational ricotta tart. The vegetable ingredients were fresh and pure, chopped from the farmhouse's own gardens. The sea bream fish was a fresh buy. The freshness really made a difference in the taste and texture of the food. First, we created the pasta dough using semolina, water and eggs. Then we got handsy. Making fresh spaghetti involved rolling the dough mixture across the strings of a chitarra pasta cutter: a curious wooden contraption with strings that looks like a harp. Once the dough is pressed flat between the strings, you then 'play' the chitarra: a melodic twang rings out from the strings, and all your spaghetti strands drop into the box. Such a delight. Massimo tried (and failed) to stifle the look of horror on his face when he saw the state of our orrecchiette pasta, which looked more like flattened muffins than anything else. Thankfully, he fixed them all in a jiffy, meanwhile telling us about his brief stint as a sous chef at a restaurant in England. Next, we prepared the sea bream, brought in fresh by fishermen that morning. We chopped up the fresh vegetables into small discs (I say we, but it was really mostly Massimo and his expert peeling and chopping skills whilst Ieva and I watched on, sipping Prosecco) and laid them over the fish in a deep oven dish, then seasoned it up with plenty of olive oil (made on-site) and herbalicious herbs (also from the garden). Finally, we made the ricotta tart. This involved a lot of rolling, slicing, and geometric layering. The dough consistency of the ricotta tart was a lot denser than the dough we created for the pasta. Exhausted from the incredibly fun and deeply satisfying ritual of making our own pasta/sipping copious amounts of Prosecco, we went to wind down by the pool (which, for the record, was freezing in November) before dinnertime, when we'd be eating all the delicious things we'd made with Massimo. 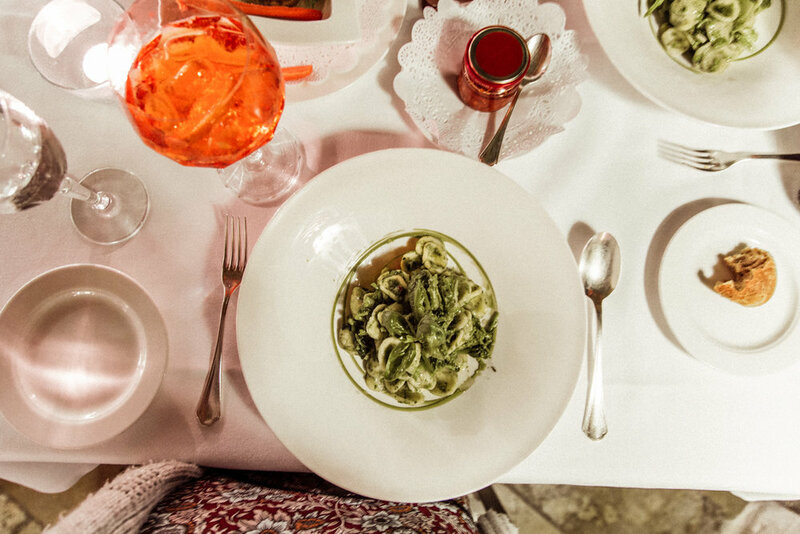 Five hours later, we were sat down in the leafy restaurant, Aperol spritzes in hand, ready to dine on traditional Apulian cuisine. They served us our starter dish - "Orecchiette ai Broccoli", made from the local broccoli variety, cima di rapa. It tasted so fresh, homely, and full of rich leafy flavour with tones of basil. Local Puglian pasta dish, orecchiette ai broccoli (cima di rapa). Pasta made by us! We were then given a palate cleanser: a shot glass full of fresh basil liqueur. Smelled like pesto, tasted like vodka. The fragrant aftertaste was really pleasant, like a sharp, sweet punch of fermented basil. My alcohol tolerance (see: hella low) doesn't allow me to handle spirits. The basil liqueur was so strong I had to sip mine bit-by-bit over ten minutes, rather than knock it back like Ieva. All the booze got to our heads since we started laughing like lunatics after Ieva demonstrated how to force exhale the alcohol - much like a panting dog - the way they do it in "Mother Russia" with extra strong vodka. We huffed away at the table until we realised we were causing a scene. The sea bream then arrived. The waiter expertly skinned the fish and served it on our plates, drizzled with vegetables and sauce. It was goooood. What a day. What a day of culinary education, delicious and moderately paced alcohol, and eating beautiful food. How Italians aren't walking around like beached whales is genuinely surprising. But seeing the effort and reverence put into their cooking, and the joy with which they eat it, elevates Italian cuisine to another level. Thank you for being so accommodating and kind, Masseria Torre Coccaro. This cooking lesson was sponsored in collaboration with the farmhouse.